Convey your special wishes with this Sensational Cadbury Dairy Milk Covey as you enhance happiness in the lives of other people. 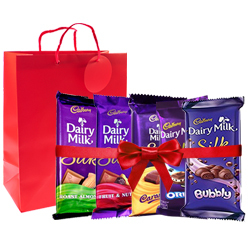 This Combo comes with some of the delightful varieties of Chocolates like Dairy Milk Silk (Caramello), Dairy Milk Silk (Chocolate), Dairy Milk Silk (Fruit N Nut), Dairy Milk Silk (Roast Almonds), Dairy Milk Silk (Bubbly) and Dairy Milk Silk (Oreo) tied with a Red Satin Ribbon in a Red Handbag. Flowers Delivery Sivakashi, Send sweets Bangalore, Wedding Cake Jabalpur, Diwali Mithai Zirakpur, Send Flowers and Gifts to Gwalior, Online Shop Chittorgarh, Flower to Dholpur, New Year Flowers Durgapur , Fresh Fruits Latur, Send Gift Vasco, Dry Fruits to Ankleshwar, Birthday Delivery Kozhikhode, Sending to Kochi, Flower shop Delhi, Moga Online Cake Delivery.